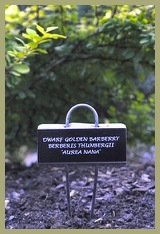 These garden markers are made of sturdy galvanized steel wire with zinc faceplates and rounded corners. You can choose between the 6 inch and 10 inch length depending on your preference. The tilted faceplate easily accommodates our 1 inch label size and makes for easy reading. All label areas are 1” x 2 5/8”. 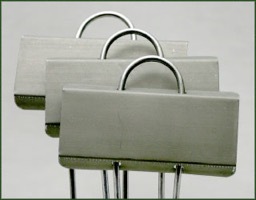 These are the 6 inch “E” series markers which have four evenly spaced holes through which the wire standards slide easily. Tilted label areas make for easier reading. These markers use either the 3/4” or 1” label. Very good for smaller plants. 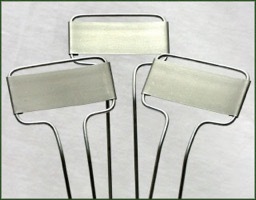 These are 10 "C" series markers for use with all sizes of plants. Label area is tilted for easier reading and attached directly to the marker top. Good for taller or larger plants. Information on ordering and shipping can be found here. Payment can be made through Paypal.